For professional athletes, the phrase "you can't win 'em all" is not only a cliched motto – it's also a job hazard that goes along with the territory. 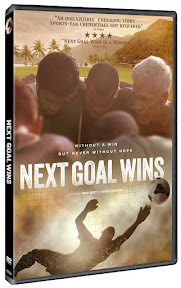 But at the start of this moving documentary, we meet the members of a soccer team on the opposite end of the spectrum that's out to prove that they can't (and won't) lose 'em all either since even one win would be a step in the right direction. And while every player has had a bad night, only one has ever endured the horror of having served as goalie during an infamous match back in 2001 when Australia beat the American Samoa soccer team with a spirit-crushing victory of 31-0. Still haunted by the events of that game and the obnoxiously adhesive, unjust nickname of “the world’s worst goalkeeper” that followed him to the mainland after Nicky Salapu emigrated to Seattle, the dutiful and dedicated player returns to his homeland nearly every year to take his place on the team and (hopefully) change the world’s mind in the process. Getting revenge for a career that’s been relegated to the stuff of sports trivia on pub quiz nights (which British helmers Mike Brett and Steve Jamison acknowledged was part of the reason they chose to tell his team's tale for their nonfiction feature filmmaking debut), Salapu engages in a nightly ritual where he replays that game vs. Australia on his Xbox. Illustrating the passionate drive, national pride and indefatigable spirit of the team where players show up to practice despite working anywhere from three to five jobs, going to school, and fulfilling all their obligations to family, church and community, Brett and Jamison bring us one of the most easily memorable and naturally uplifting sports-related documentaries I’ve seen in a long time. 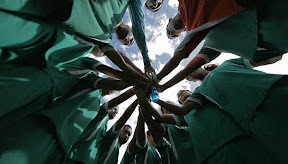 Matching the commitment displayed onscreen by the team offscreen with their film, after Salpu temporarily retired (having never won a game in his entire life), the directors remained devoted to capturing the efforts of the players who refused to give up despite being ranked dead last for ages. 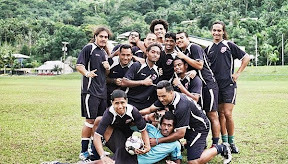 As such they encountered one of the biggest surprise of their filmmaking lives when – after American Samoa management called the soccer federation for help before a FIFA World Cup qualifying match – they're sent the one and only applicant for the job in the form of Dutch coach Thomas Rongen who has a mere month to turn things around. A tough-talking atheist who’s overcome a devastating loss in his own life, Rongen arrives as a Cool Runnings-like fish-out-of-water. Initially hitting the community with the force of a tropical storm, the colorful Rongen immediately clashes with those in charge before ultimately changing the team and by extension the future of the Pacific Island community in a twist so perfectly plotted that you'd almost believe the filmmakers had planned it that way all along. Reaching out to not only Salapu but a couple of other prospects who – like far too many of the island’s youths leave American Samoa for the mainland or the military because there are so few opportunities available there to make a living – Rongen brings in athletes ready to play for the pride they have in their cultural heritage vs. (the nonexistent) big payday. Vowing to whip the existing team into shape, the middle-aged Rongen takes a grueling three hour hiking trail up a mountain in order to inspire some of his players that can't physically last through an entire game to get into peak World Cup condition. Working with their former coach (whom in the addictive first act we discover is almost as quotable as their far more boisterous replacement) to help get a better read on the team, Rongen is able to bring the group together on the field and off in a way that’s as emotionally moving as it is downright entertaining. And although it’s the infectious enthusiasm and integrity of the players that eventually winds up making global headlines after the team not only scores a goal but manages to win a game, Next's viewers are quick to realize that we've been witnessing heroism all along (regardless of whether the scores or statistics reflected that). Much like the eponymous kids who hurriedly yell “next goal wins” before returning home for dinner or back to class in time after recess, Brett and Jamison’s vital work celebrates those who play for the love of the game. A stunning and vivacious digitally shot production, Next Goal Wins is refreshing in that it has absolutely nothing to do with headlines about draft picks, contract negotiations, free agent greed, or commercial endorsements that we hear about far too often and everything about who the American Samoan players are as individual people and as an overall team. Whether it’s in the simple victory of a game for Salapu or a much more emotionally cathartic journey than Rongen had ever knew awaited him when he first stepped off the plane with his wife, Goal is naturally inspiring in its study of a team that’s never known the meaning of the phrase “paycheck player” and a community where there’s no such thing as a "fair-weather fan." 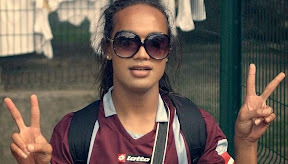 And this is particularly evident in the film’s most moving portrait about a player who (despite being listed as Johnny on the roster) lives 24/7 as Jaiyah Saelua as a member of fa'afafine or Samoa’s third gender and not only brings her full heart and soul to each game but is also – as we quickly discover – the heart and soul of the overall team. From chronicling Jaiyah's evolution from the biggest fan on the bench to the first transgender player ever to start in a World Cup qualifying game to the way a teammate that didn’t see a single second of game-time is nonetheless captured in a New York Times photo with an enormously proud smile on his face, Goal is a winner in every sense of the word. And with this in mind, I’m sure it’s only a matter of time before the House of Mouse turns Next Goal Wins into another finely crafted formulaic Disney sports movie inspired by actual events in the same vein of Runnings, Remember the Titans, or Glory Road. Yet even if they do, they’ll never be able to duplicate the authenticity, excitement and hard won wisdom of the actual American Samoan players in this Tribeca Film Festival official selection. A mesmerizing debut, Goal champions the true American underdog spirit far away from the continental U.S. that exists on a tiny pacific island where a certain goalkeeper returns every year, waiting for a non Xbox-related Australian rematch.